Police Scotland is appealing for information after an 18-year old man was assaulted at Stonehaven Railway Station, Arduthie Road, just before midnight on Saturday (December 3, 2016). 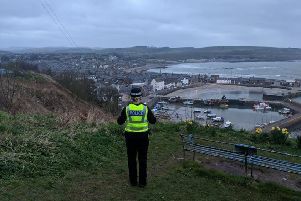 The man sustained a broken jaw and officers want to trace a male and female in connection with the incident. The female is described as being in her late teens to early twenties, tall, of a slim build with long brown hair. She was wearing a beige coloured jacket and beige knee high boots. The male is described as being in his early twenties, of a medium build with short dark hair. He was wearing a dark blue puffy jacket, blue jeans and grey and black trainers. Anyone with information should contact Police on 101 or Crimestoppers on 0800 555111 if you would prefer to remain anonymous.